PORTLAND, (GaeaTimes.com)- Vertical Horizons Tree-house Paradise, may be one of those experiences, which you have been waiting for, and it would be more so, if you are an adventure freak, and love experiencing the virginity of the nature. The three beautiful tree- house retreats are all set to give you the most memorable winter celebration, from November till February. Located in the exotic Redwoods, Oregon Caves National Monuments, you can chose to stay in any of the three beautiful tree- houses, Cottage, Shiitake or Calypso. Although the environment gives the raw taste of the nature, and at times you may feel to be in the shoes of Adam And Eve, the services provided by the Vertical Horizons Tree-house Paradise, is no less than any other hotels. 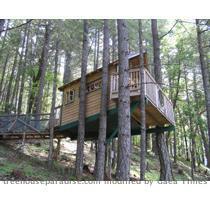 To make it better, they will provide you with several other activities that can familiarize you more with the forest. You can go for the “Experience The Fall Salmon Run”, “a Guided Mushroom Picking Expedition” or “Technical Tree Climbing” during your stay at the Vertical Horizons Tree-house Paradise all through November and December. Other amenities include, large car parking, fishing, BBQ, disk golf course, volleyball, horse shoes etc. The winter season is also offering special packages, that include, JUST NESTING package for, $250 for your family holiday, TWEETLY ROMANTIC package for $270, for the lovers who want to make their winter more memorable, or a simple HAPPY BIRD-DAY package for $260 for your child, where you will be provided with birthday cakes, balloons, decorations and other Nesting Festivities, all arranged by Vertical Horizons Tree-house Paradise. You can also customize your package on your wish. The food and room services will include exotic Continental Deluxe Breakfast, or BBQ dinners, delivered right to your room, pampering you all through out your stay, keeping you way from your daily routines.